Appearance: He is about 5'7" and weighs approximately 130 pounds. Ko'Oni normally adorns the same fashioned Gi that Kimimaro wore with a few differences. It will either be black or white with his Ninja headband used as a waist band. The sleeves and pants are baggy and used to hide part of his legs and completely conceal his arms. History:[Birth Arc]-Our story begins many years before, in a small house on the coast of Kumogakure, during the night of a raging hurricane. The night was pitch black except for when the bloodish tint of the crimson moon would peek and glimpse through the torrent. The small house was boarded up as a Kaguyan couple was inside taking shelter. There was Kitsune who was in labor, and Ookami who was worried of the condition of his wife. As the time passed the storm relentlessly battered the house, and Kitsune's condition began to degrade even further, but when things seemed to take a turn for the worst, she successfully delivered her son. And in an instant, time seemed to slow down as the new parents held their newborn baby. And with a wail, the boy showed that he was healthy, as it seemed to drown out the howling of the monsoon. Later that night his mother passed on with him in her arms. Yet all wasn't lost, for today a warrior was born and the world got another angel. [Orphan Arc]-Here at the age of five, the boy, called Ko(kid) by his father, was made an orphan. One day while practicing his kekkei genkai behind their small house, Ko was approached by the Kiri Anbu. To where he was then told the tragic fate of how his father fell honorably in battle. During the mission, his father put his life in the line to save a squad of shinobi. Which he did successfully but was captured, tortured, and even killed with his own Bone blade. At first the boy was stunned, but upon taking it all in, Ko fled deeper into Kirigakure. It was there that he spent the next two years living on the streets, stealing to get by and sleeping where ever he could. Until one day a master swordsman from Kumogakure caught him trying to pickpocket him. Yet instead of punishing the boy, the man seen potential in him and invited Ko to join him. At first he was hesitant, yet agreed to, once the man offered to train him. [Kumo Arc]-Upon arriving at Kumogakure, Ko and his new sensei, Myoushu Ro-Tasu(Master Lotus) wasted no time on training. 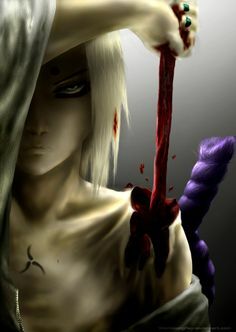 The man helped the boy develop further in his kekkei genkai by teaching him the way of the blade/sword. After a full year of being in Kumo, he was then enrolled into the academy. [Academy Arc]-During his time in the academy, Ko never really made friends. Mainly because he felt like a loner. Due to the fact that he is a Kaguyan, originally from Kirigakure. Yet over the period of the class, Ko quickly rose to the top and was awarded with the genin status. Once telling his master, Myoushu seemed happy yet also became more secretive as time passed. [Genin Arc]-As his time as a genin, he continued to hone his craft, as well as complete his missions assigned to him. Doing so with remarkable efficiency, but by now Myoushu began to be harder on him. Scolding and punishing him when he made a mistake, which Ko thought it odd, since the man has always been kind to him. Yet he dismissed it as his sensei was pushing him to be the best he can be. In a way Ko was right, although the sensei's true alterior motives would soon come to light and be clear. Yet for now all he could do was to continue to forge his destiny and accomplish his own goals. Approved I edited out sensory from specialty, its fine if you want to take it as a jutsu.